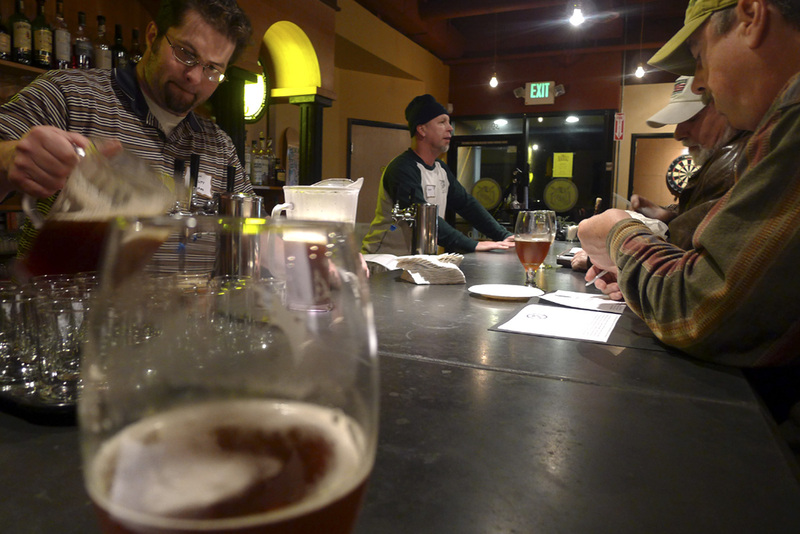 Lompoc Brewing held its annual Holiday Beer preview last week. It was particularly interesting this year for reasons that go somewhat beyond the beers. The reality is, they've been through some changes at Lompoc Brewing in the last year. Yet they carry on. They lost the Old Lompoc brewpub on Northwest 23rd. This was the original location, converted to a brewery in 1996 and subsequently purchased by Jerry Fechter and the late Don Younger in 2000. They renamed the business New Old Lompoc. The old pub/brewery resided in a building that was demolished last spring to make way for a new structure that will house apartments, retail shops and parking. Progress takes no prisoners in Northwest Portland. 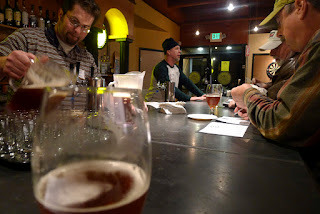 Demise of New Old Lompoc reduced Lompoc's portfolio to four locations: The Fifth Quadrant (headquarters and brewery) and Sidebar (tasting room) on N. Williams; the Hedge House pub on SE Division; and the Oaks Bottom Public House in the Westmoreland neighborhood. It won't stay that way for long. Fechter has signed a lease to open a pub in the new building in Northwest. This will be a pub only, as installing a brewery in the new space would have been beyond problematic. All beer production has shifted to the Fifth Quadrant. Honestly, though, the bulk of brewing has been done there for several years, as the NOL brewery was small and rather antiquated. There were human losses, as well. Brewers Dave Fleming and Zach Beckwith departed during the year. Fleming, head brewer for several years, left to take a position in hops sales (my story here). I've heard murmurs that he's back brewing somewhere, but I can't confirm. Beckwith initially left to help launch Pints Urban Taproom in the Pearl (my write-up here) and later moved to Three Creeks Brewing in Sisters. With the departures of Fleming and Beckwith, Bryan Keilty took over as Lompoc's head brewer. Keilty had managed Lompoc's production and barrel aging program for several years. His stable mates now include Irena Bierzynski (my story here) and new addition Josh Merrick. It's a good group as long as Jerry stays out of the way. Just kidding...sorta. The also went through a minor rebranding involving beer labels (my story). Lompoc, which distributes about two-thirds of the beer it brews to commercial accounts (in 22 oz bottles and kegs) in Oregon and Washington, felt the old labels were slightly threadbare. Updated labels began appearing in the spring and continued through recent releases of Monster Mash Imperial Porter and LSD (Lompoc Special Draft). I like the new look. There are seven beers on the Lompoc holiday list this year. If you keep track of these things at home, that's two less than the usual nine. The official reason for the change is the demise of the Old Lompoc brewery, which did poke a small hole in production. Anyway, seven holiday beers is probably enough. All of these will be officially released on Nov. 27. 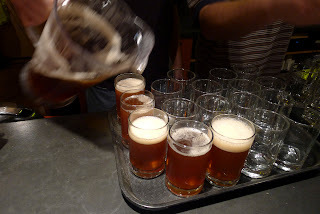 Jolly Bock (7.3% ABV) was the first beer on the tasting itinerary. The beer, a lager, is nice and malty with a deep amber color. It came straight from the brite tank so the beer will likely change a bit prior to its official release at the end of the month. This is a draft-only offering. Next came 8 Malty Nights (6.5% ABV). This chocolate rye beer is smooth and features a smooth, mildly sweet finish. It's a bit stronger in aroma than it is in flavor, but I really liked this beer. You'll be seeing it on store shelves soon....grab some while you can. Franc'ly Brewdolph (7.6% ABV) is a red ale brewed with special Belgian yeast, then aged for a year in Cabernet Franc barrels. This beer will be served at the upcoming Holiday Ale Festival, where it will certainly taste different than it did last week. Why? Because the beer had only just come from the barrels and been blended. It was flat and over-oaked. Carbonation will certainly change the character of this brew, possibly bringing fruit notes to the forefront. I recommend giving it a try if you see it. 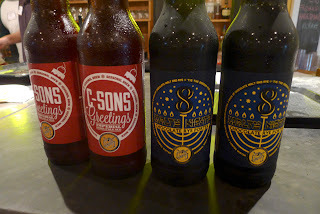 C-Sons Greetings (8% ABV) is a bigger version of Lompoc's popular C-Note Imperial Pale Ale. They use more than seven "C" hops for bittering and dry-hopping, so it's a serious hop bomb. The aroma is fantastic, as are the piney, citrus flavors. There was wide agreement among tasters that this is an excellent beer. I found it to be slightly tamer from the bottle than from draft, but that's to be expected. It's terrific stuff and I've already seen it in stores. Git some! Old Tavern Rat (9.4% ABV) is barley wine that was aged almost a year. Caramel and toffee sweetness balance out a fairly hoppy beer. This beer is only available on draft and there's no barrel-aged version of Old Tavern Rat this year...look for it in 2013. 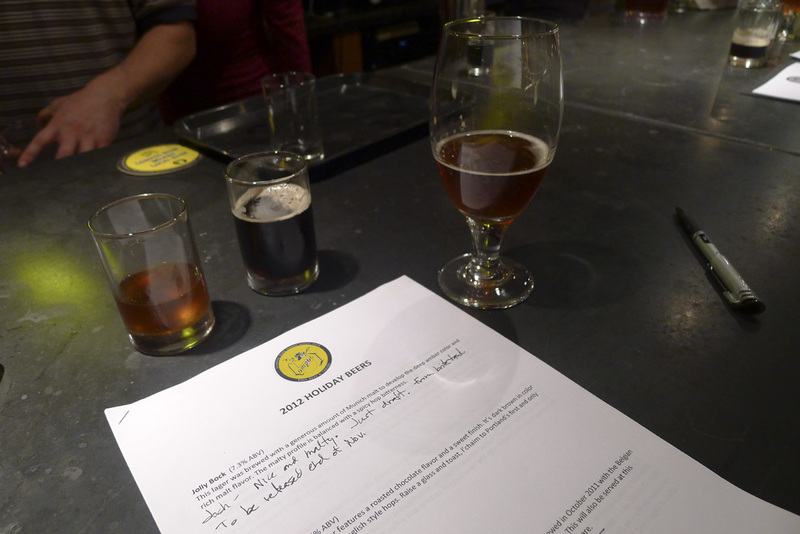 The final beer was Bourbon Barrel Aged Wee Heavy (7.5% ABV), which spent nine months in bourbon barrels. They used dark, smokey malts, along with 50 pounds of molasses, to make this beer. It's dark, smokey and complex. A fairly strong bourbon aroma overlays a beer that possesses a mildly sweet body and a smooth, dry finish. Quite good. The seventh beer on Lompoc's holiday list is Blitzen (4.6%), a golden ale infused with cinnamon, glove, lemon zest and fresh ginger. Sounds pretty good. But the beer was still in the fermenter, so we didn't get to taste it. Unhappy face. Finally, Lompoc will have a second beer at the Holiday Ale Festival, this one a collaboration with Breakside Brewing called Breakside India Passion Elixir. It's described as a "winter hop bomb," so you may want to seek it out at the festival if that's your thing. As noted above, these beers will be launched to the public at Lompoc's Holiday Release Party at Sidebar on Tuesday, Nov. 27, 4 to 10 p.m. You'll want to go with the taster tray...trust me on that. Just to show they're user-friendly, the folks at Lompoc will be offering complimentary appetizers.